In 1987, Max-Hervé George’s father bought a life insurance contract from Aviva France. But this was no ordinary life insurance contract. For some reason – which is still lost on me – the insurance company offered a contract that allows the purchaser to buy into any investment fund of his choosing, on Friday, but at the previous Friday’s prices. He gets to pocket the investment returns… of last week’s top-performing fund… after the performance of all available funds is known. Mr. George has reportedly exercised his contractual right with fervor, profiting from last week’s winners, week after week, earning an unimaginable 68% per year! The story is truly remarkable. And if you think Mr. George’s deal is “too good to be true,” you’re more or less correct. The insurance company offered these “magic ticket” contracts to a very small group of wealthy clients (who, back then, had to visit the broker in person). They have since bought out most of the contract holders. And they’re fighting Mr. George’s contract in court, since he (wisely) refused to sell it back to them. Suffice it to say, YOU will NEVER be able to buy a “magic ticket” quite as nice as Mr. George’s. Invest in high-returning assets (typically called “risk assets”), but only when it’s worthwhile and safe to do so. Avoid risk assets when it’s NOT safe to own them. And I believe I’ve developed a strategy that does just that. It shows the annualized returns of a variety of risk assets – stocks markets, in general, but also highly volatile sectors, like biotech, along with junk bonds. But these are not buy-and-hold returns. Since my market-timing model very simply tells me when to be IN risk assets and when to be OUT… I can segment the performance of any market, according to the signal provided by my model. In blue, you’ll see the annualized returns of each asset while my system says it’s SAFE to be in them. In red, I’ve plotted the annualized returns generated while my system said it’s DANGEROUS to be in them. 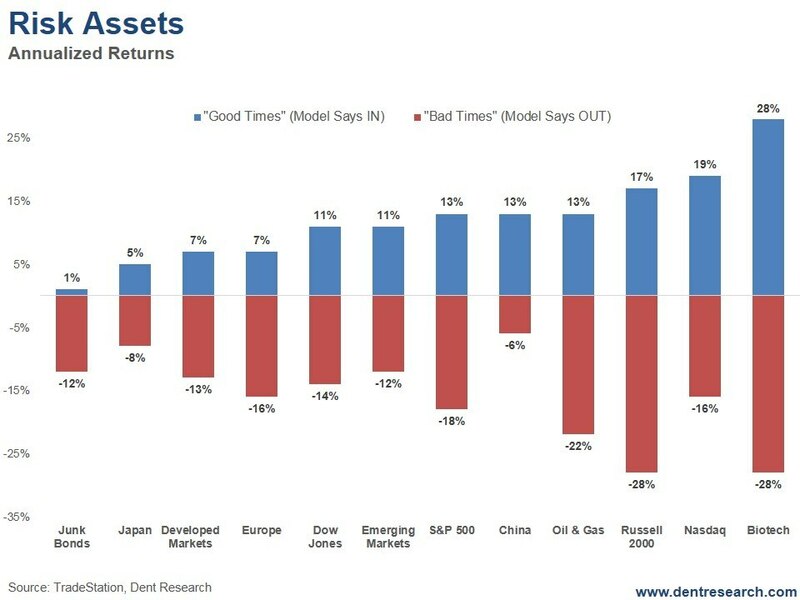 Now, most investors intuitively understand that it’s no easy feat to “time” the market. And unless you have a magic ticket like Mr. George’s… no market-timing model will get it right all the time. But getting it right most of the time, combined with good risk management, is more than enough to beat buy-and-hold returns and accumulate a considerable sum of money. I’m sure you’ll agree that if you could capture, say, 80% of the returns during the “good” times… and avoid, say, 80% of the losses during the “bad” times… you’d stand to do quite well! The project has been so successful that we’ve just closed the doors to our first round of founding-member invitations. If you missed the chance to join in, don’t worry – we’ll be offering access to this strategy in the Spring of 2017. And I plan to share with you more details about this strategy in the weeks and months ahead. In the meantime, you can read more about my views on the “Active vs. Passive Investing” debate here. And you can read the full story of Mr. George’s “magic ticket” here. The content of our articles is based on what we’ve learned as financial journalists. We do not offer personalized investment advice: you should not base investment decisions solely on what you read here. It’s your money and your responsibility. Our track record is based on hypothetical results and may not reflect the same results as actual trades. Likewise, past performance is no guarantee of future returns. Certain investments such as futures, options, and currency trading carry large potential rewards but also large potential risk. Don’t trade in these markets with money you can’t afford to lose. Delray Publishing LLC expressly forbids its writers from having a financial interest in their own securities or commodities recommendations to readers.